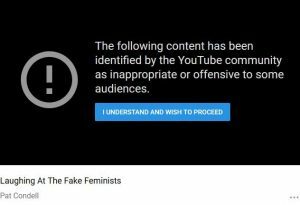 Google's discrimination between liberal and non-liberal content providers on YouTube - PC Buyer Beware! It looks as if telling the truth about anything has almost been made into right-wing hate crime on social media and Google’s YouTube. Google, Facebook, Twitter and other social media now clearly regard themselves as having a divine right to determine what people are allowed to view, hear or read by banning or restricting access to material that they find is not in agreement with their politically-correct, globalist liberal ‘tastes’. For example, Pat Condell tells it as it is, but Google’s YouTube has removed his channel’s ability to earn money from ads, some of his videos have been banned, none of them can be shared or the following warning appears whenever anyone tries to watch one of his videos that doesn’t pass YouTube’s ‘quality’ control. My own Facebook page lost most of its audience immediately after I posted content of the kind in this post on it. In my opinion, it’s time for people of intelligence and taste – who aren’t using them to help get this state of affairs reversed – not to have anything to do with these liberal propaganda outfits. For example, clicking on their customised ads, built by using acquired personal information, sends tax-free money to their tax havens.